Summer in Milwaukee is the best; summer in the Midwest is even better. Join Milwaukee Record and Miller High Life as we search the city and beyond for the Spirit Of Summer. It’s always great to get away. Sleeping in a comfy bed somewhere exciting and new with somebody else taking care of you is tough to top. However, if time or budgetary constraints won’t allow you to leave town, and the idea of staying in some downtown hotel doesn’t seem all that appealing, there are some unconventional lodging options that will help you get away from your normal routine without having to leave the city. From baseball park campouts and suites above bars to museum sleepovers and Airbnbs offered by Milwaukee musicians, here are some unique staycation getaways. When Boone & Crockett relocated to Walker’s Point this spring, the cocktail lounge moved into a space that was considerably larger than its Bay View digs. Along with the new spot for Boone proper also came the 296-capacity Cooperage venue, a permanent spot for Taco Moto, and one other awesome new amenity. Yes, “New Boone” has a suite on Airbnb. The “Castor House” guest suite costs $250/night, but you can’t really beat the location of the two-bedroom, four-bed space that’s nestled just above Boone & Crockett. Adding to its proximity to craft cocktails, tacos, Pedal and Paddle Tavern access, and entertainment is a full kitchen, access to free wifi, a television, on-site parking, and heat/air conditioning included. The stylish interior is decorated by URSA, and much of it is available for purchase. If you don’t feel like leaving Boone’s property after last call, you now have an option. Brett Newski has been everywhere. After living in Vietnam and touring throughout Europe, Asia, South Africa, and all-around the U.S. and Canada, the Milwaukee-based singer-songwriter has experienced all kinds of accommodations and has slept on floors in every country. Those lodging experiences on the road seem to have helped him (and his girlfriend Anna) craft a lovely little “Polish Flat” for touring musicians and non-musicians alike in the heart of Bay View. Newski’s Airbnb runs $69 a night. The one-bedroom flat has heat and air conditioning. There’s a laptop-friendly workspace, a cozy kitchenette that’s stocked with cooking basics, a nice bathroom, and a queen bed. The stylish 1870s era home is just a short walk from Cafe LuLu, Colectivo, and a number of other Lincoln Avenue-adjacent businesses in bustling Bay View. There’s a private entryway, so you can enjoy the space without issue. If you play your cards right, you also might be able to catch Newski on one of the rare weekends he’s not on the road. Who knows, maybe you could arrange a private show or have Newski lead you on one of his patented “Crusty Adventures” around town. That failing, you can still feel at home in this nifty Bay View bungalow for less than $70. Those of you who are seeking interesting accommodations for visiting family and friends, or just a one-of-a-kind staycation destination should look into renting Foundation’s second floor “Captain’s Quarters” on Airbnb. The two bedroom, one bathroom space runs the entirety of Foundation’s upper level and can host up to four guests. The $115/night dwelling is outfitted with a private tiki lounge that’s decorated with pufferfish lights, wood carvings, and oceanic decor befitting of a getaway within a getaway. There’s also free parking on the premises, wireless internet, televisions, and a strict no children policy. When he isn’t screaming as front man of Milwaukee metalcore outfit Knaaves, Andy Parmann is delighting out-of-towners with his spotless and understated south side upper that’s featured on Airbnb. Dubbed “Radio City,” the two-bedroom, one-bathroom mid-century flat can host up to four guests. There’s also a dining area that’s decorated with a bunch of old radios. With just a $59/night price tag, guests can use the money they save at nearby haunts like Iron Grate BBQ, Sabrosa, Gold Rush, Hawthorne Coffee, that place from Bar Rescue, or any number of places in nearby Bay View. You should be respectful to the home’s owner, of course, but based on how loud his band is, sound probably won’t be much of an issue. Tickets are $120/person (and $80/children 3-13 years old, free for children 2 or younger). This year’s Field Of Sweet Dreams happened July 28, but keep your eyes peeled for the 2019 announcement early next season. We can tell you from personal experience, it’s pretty fun. The idea of sleeping overnight in a museum is a strangely irresistible one, having been explored in everything from The Royal Tenenbaums and From The Mixed-Up Files Of Mrs. Basil E. Frankweiler to the Night At The Museum franchise. For the most part, however, those museum all-nighters have been reserved for kids, and/or Ben Stiller. 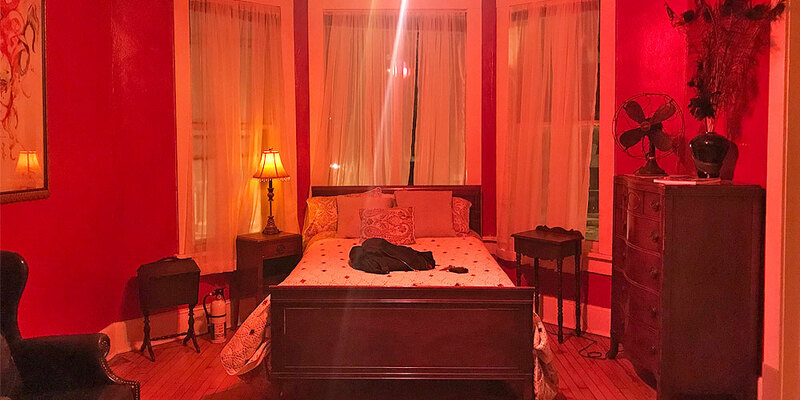 Bot not anymore: Every year since 2016 (usually in September), the Milwaukee Public Museum hosts its very own adult sleepover, open to anyone 21 and older who dreams of dozing off in the vaguely creepy Streets of Old Milwaukee. Add in guided tours, curator chats, and films in the Dome Theater, and you have a doozy of a night. Oh, and it’s kid-free, and the Milwaukee Public Museum is amazing. Tickets are $125 per person, and include admission and programming, food, two drink tickets, a late-night snack, and breakfast. If family fun is more your thing, Milwaukee Public Museum also offers “Museum Overnights” for scouting troops and families with children ages 6-12. There are hands-on activities, a show in the Dome Theater, a flashlight-guided tour through the exhibits, and a change to sleep among MPM’s vast collection. Museum Overnights are $55/person ($45 for members) and $50/person for groups of 10 or more. This could be you! The $350-a-night penthouse is actually a full-floor apartment that’s complete with a queen-size bed, a working fireplace, a modern kitchen, and a handful of sitting rooms. It’s nice, but not too nice. The fireplace is original but the washer and dryer in the kitchen definitely aren’t. The bathroom is a little scuffed-up, but hey, it has a Jacuzzi. Everything smells like dust and goths with disposable income. It’s not a hotel, but it’s fine. The space is limited to two (living) occupants and requires people to sign a waiver that indemnifies Shaker’s from any responsibility for “any injuries, damage, harm, death or psychic calamity which may occur during, or after [their] attempted stay-over in the ‘extremely Haunted Penthouse’ above Shakers Cigar Bar.” You’re probably not going to see a ghost at Shaker’s, but you might learn a thing or two about yourself while you’re there.